Some of the other exhibits in the New Zealand Room, besides out diorama, have been revealed on Stuff today. The exhibition will feature a Gallipoli gallery of nearly 200 colourised original photographs of the Kiwis who went to Gallipoli, from their training in New Zealand in 1914, right through to the evacuation of Anzac in December 1915. Weta Digital artists have transformed the original black and white photographs into realistic colourised images. 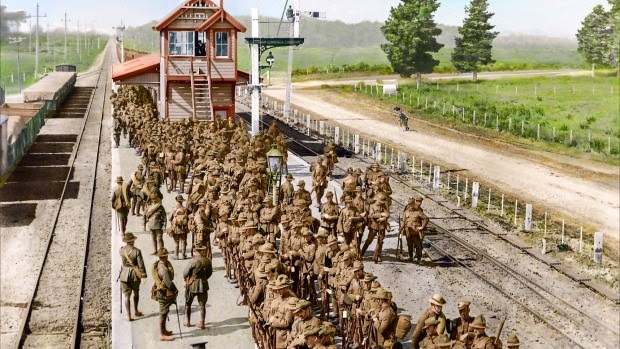 The above sample picture shows the first step of a long journey: the Canterbury Infantry Battalion await a train to take them to their troopship in Lyttelton Harbour, 23 September 1914. The New Zealand Room opens next weekend on 2 May.